Hotz, who is principal investigator of the project, was joined by co-investigators Michael E. Hoffer, M.D., professor of otolaryngology at the Miller School of Medicine, and Bonnie Levin, Ph.D., director of neuropsychology and professor of neurology, as well as executives of Scythian Biosciences, who are funding the $16 million, five-year grant. In Jerusalem, the team met with Dr. Michael Dor, chief medical officer at the Ministry of Foreign Affairs and the medical head advisor of the Medical Cannabis Unit for the Israeli Ministry of Health. In Tel Aviv, they visited Dr. Shai Efrati, director of the Sagol Center for Hyperbaric Medicine and Research. At Hebrew University, the UM investigators talked with Dr. Raphael Mechoulam, recognized as the leader in the field and founder of the endocannabinoid system, and Dr. Esther Shohami, who has also done groundbreaking work in endocannabinoids and traumatic brain injury. “The advancement in the effects of cannabidiol research, as well as other work in neuroregeneration in many centers across Israel, is important, and with their willingness to collaborate will expedite and further our projects,” Hotz said. Researchers in the study being conducted by the Miller School and The Miami Project to Cure Paralysis have begun pre-clinical studies evaluating several rodent models of TBI. A mild TBI clinic at The Lennar Foundation Medical Center is now testing nine proposed outcome fields, which include cognitive, behavioral, psychosocial, sleep, pain, sensorimotor, cardiovascular, inflammatory biomarkers, as well as neuroimaging studies, which are being reviewed and evaluated. 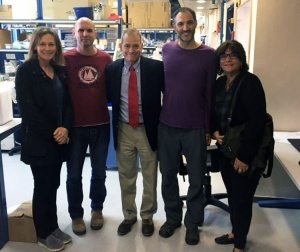 Joining the Miller School team on the Israeli trip were Scythian Biosciences executives Jonathan Gilbert, CEO, and David Schrader, COO.